For the village in Iran, see Makran, Iran. 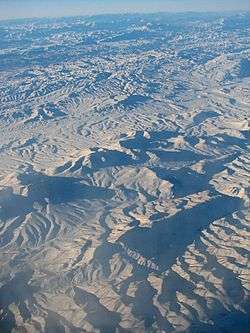 The central Makran range in Pakistan. Makran (مکران) (pronounced [mæk'rɑːn]) is a semi-desert coastal strip in Balochistan, in Pakistan and Iran, along the coast of the Persian Gulf and the Gulf of Oman. The name Makran derives from Maka, borne by an overlapping satrapy of the Achaemenid Empire. Another, older derivation is from the Makar, or sea dragon, after the humpback whales or whale sharks that abound in the north Arabian Sea. The word Maka later became Makran, as it is common in closely related ancient Avestan and Old Persian languages to use "an" and "ran" at the end of plurals. 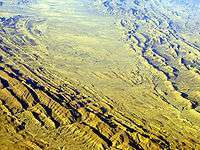 The southern part of Balochistan is called Kech Makran on Pakistani side and Makran on the Iranian side which is also the name of a former Iranian province. Prior to that, in Achaeminid times, the name Maka was used for the region. The Sumerian trading partners of Magan are identified with Makran. In Varahamihira's Brihat Samhita, there is a mention of a tribe called Makara inhabiting the lands west of India. Arrian used a derivation of Makran from the Persian term mahi khoran, meaning "fish eaters" for Baluchi inhabitants of coastal areas, but this is considered "erroneous." Maka was an important early eastern satrapy of Cyrus the Great, founder of the Achaemenid Empire. It corresponded to modern day Bahrain, Qatar, and United Arab Emirates, plus the northern half of Oman, as well as Balochistan and the Sindh province of Pakistan. The Babylonians had made voyages using Maka to communicate with India. After Cyrus' death, Darius I of Persia succeeded his throne, and, according to Greek historian Herodotus, wanted to know more about Asia. He wished to know where the "Indus (which is the only river save one that produces crocodiles) emptied itself into the sea". After personally leading his elite forces, whose ranks were restricted to those with Persian, Mede, or Elamite ancestry, to fight the invading Scythians, he led a campaign of conquest towards South Asia, conquering Sindh in 519 BC and constituting it as his 20th satrapy. After the fall of the Achaemenid Empire, Alexander the Great also crossed Maka in his campaign of conquest. His army marched through a harsh desert path in Makran, where he lost a significant number of soldiers due to the harsh desert conditions. Herodotus on several occasions mentions the contributions of the "Mykians", who inhabited the eastern portion of the Achaemenid Empire. They are mentioned as "the men from Maka" in daiva inscriptions. The "Daiva inscription" is one of the most important of all Achaemenid inscriptions. The Mykians served in the army of Xerxes the Great at the battle of Thermopylae. They are also thought to be responsible for inventions such as qanats and underground drainage galleries that bring water from an aquifer on the piedmont to gardens or palm groves on the plains. These inventions were very important reasons behind the success of the empire. 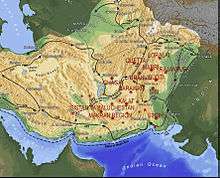 The Mykians of the other side of ancient Maka, the present day region of Balochistan and Sindh, are thought to have later become independent, as they are not mentioned in Arrian of Nicomedia's account of the campaigns of Alexander the Great; he mentions only the Omani side of Maka, which he calls "Maketa". The reasons for this may have been the arguably unjust rule of Xerxes. 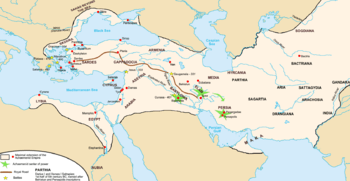 Paths that Alexander the Great took. Abū Rayḥān Muḥammad ibn Aḥmad Al-Bīrūnī , states in his book India that the coast of India begins with Tiz the capital of Makran. Further evidence in the Chachnama makes perfectly clear that many areas of Makran as of Sindh had a largely Buddhist population. When Chach marched to Armabil, this town is described as having been in the hands of a Buddhist Samani (Samani Budda), a descendent of the agents of Rai Sahiras who had been elevated for their loyalty and devotion, but who later made themselves independent. The Buddhist chief offered his alligience to Chach when the latter was on his way to Kirman in 631. The same chiefdom of Armadil is referred to by Huen Tsang 0-Tien -p-o-chi-lo, located at the high road running through Makran , and he also describes it as predominantly Buddhist , thinly populated though it was , it had no less than 80 Buddhist convents with about 5000 monks . In effect at eighteen km north west of Las Bela at Gandakahar , near the ruins of an ancient town are the caves of Gondrani, and as their constructions show these caves were undoubtedly Buddhist .Traveling through the Kij valley further west (then under the government of Persia) Huien Tsang saw some 100 Buddhist monasteries and 6000 priests . He also saw several hundred Deva temples in this part of Makran , and in the town of Su-nu li-chi-shi-fa-lo-which is probably Qasrqand- he saw a temple of Maheshvara Deva , richly adorned and sculptured . There is thus very wide extension of Indian cultural forms in Makran in the seventh century , even in the period when it fell under Persian sovereignty . By comparison in more recent times the last place of Hindu pilgrimage in Makran was Hinglaj, 256 km west of present day Karachi in Las Bela. Umar looked at the messenger and said: "Are you a messenger or a poet?" He replied, "Messenger". Thereupon Caliph Umar instructed Hakim bin Amr al Taghlabi that for the time being Makkuran should be the easternmost frontier of the Islamic empire, and that no further attempt should be made to extend the conquests. Makran remained part of the Umayyad and Abbasid Caliphate, and was also ruled by Muslim Turks, Persian. It was conquered by Mongols in the 13th century AD but failed later, and in the 18th century the Baluch Nawab had agreed for governing the Makran region with mutual interest between both sides, as the British failed to conquer the area by force. Map of the Baluchistan Agency. From the 15th century onward, the area was ruled by the Rind tribe which was headed by Mir Chakar Rind later by Hooth Dynasty In Makran Which led by Hooths and Khosags, Buledis, Noesherwani, Ghichkis and in small particular part govern by Gorgeig and Sardarzahi. 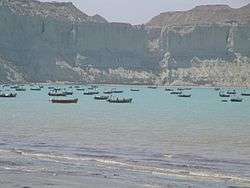 makran by In the late 18th century, the Khan of Kalat is said to have granted sanctuary at Gwadar to one of the claimants for the throne of Muscat. When that claimant became Sultan, he kept hold of Gwadar, installing a governor, who eventually led an army to conquer the city of Chabahar some 200 kilometres to the west. The sultanate held onto the Makran coast throughout the period of British colonial rule, but eventually only Gwadar was left in the hands of the sultan. 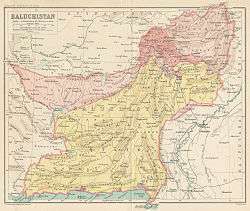 On the independence of Pakistan, Makran became a district within the province of Balochistan, minus an area of 800 km² around Gwadar. The enclave was finally transferred in 1958 to Pakistani control as part of the district of Makran. The entire region has been subdivided into new smaller districts over the years. Gwadar beach in Makran region. Today the economy of Makrani Baloch is largely based on use of the oceans. The narrow coastal plain rises rapidly into several mountain ranges. Of the 1,000 kilometres (620 mi) coastline, around 750 kilometres (470 mi) is in Pakistan. The climate is dry with little rainfall. Makran is very sparsely inhabited, with much of the population concentrated in a string of small ports including Chabahar, Gwatar, Jiwani, Jask, Sirik, Gwadar (not to be confused with Gwatar), Pasni, Ormara and many smaller fishing villages. There is only one island off the coast of Makran, Astola Island, near Pasni although there are several small islets. The coastline can be divided into an eastern lagoon coastline and a western embayed coastline. The main lagoons are Miani Hor and Kalamat Hor. The main bays of the embayed coast are Gwadar Bay and Gwatar Bay. This latter bay shelters a large mangrove forest and the nesting grounds of endangered turtle species. The Mirani Dam provides irrigation, flood prevention and water supply to Gwadar city. ↑ "Iranians and Turanians in Avesta". Ali A. Jafarey. Retrieved 2010-09-10. ↑ "Makran". www.britannica.com. Britannica. Retrieved 18 June 2016. ↑ Hansman 1973, p. 555. 1 2 "History of Herodotus by Herodotus - Massachusetts Institute of Technology (MIT)". mit.edu. Retrieved 2010-09-11. ↑ "The history of antiquity". Max Duncker. Retrieved 2010-09-10. ↑ "Persia". Angelfire.com. Retrieved 2010-09-09. ↑ "Iranian Provinces: Sistan and Baluchistan". Iranchamber.com. Retrieved 2010-09-07. ↑ "Ancient Persia". Ancientpersia.com. Retrieved 2010-09-09. ↑ "Darius the great". mdc.edu. Retrieved 2010-09-10. ↑ "The largest empire in ancient history". axehd.com. Retrieved 2010-09-10. ↑ "Full Text of Herodotus, Book 7,8 and 9". archive.org. Retrieved 2010-10-02. 1 2 "The History, by Herodotus (book7)". cadelaide.edu.au. Retrieved 2010-09-07. ↑ "Maka". livius.org. Retrieved 2010-10-01.